A regular breeding species and migrant, the Least Flycatcher was common in abundance during the Minnesota Breeding Bird Atlas (MNBBA). Widely distributed and common across the northern United States and Canada to the tree limit, including south in the Appalachian Mountains to northern Georgia. Highest densities have been recorded in northern Minnesota and on the North Dakota border with Manitoba and Saskatchewan (Figure 1). Assigned a Continental Concern Score of 11/20 and listed as a Common Species in Steep Decline by Partners in Flight. Long-distance migrant, winters from Mexico to Central America. Almost exclusively flying insects; occasionally gleans from foliage. Saplings, subcanopy, and canopy; usually in deciduous tree species. Breeding distribution and relative abundance of the Least Flycatcher in North America based on the federal Breeding Bird Survey from 2011 to 2015 (Sauer et al. 2017). According to Roberts in 1932, the Least Flycatcher was “one of the most common and widely distributed birds of the state.” He reported nesting activity from Jackson and Fillmore Counties on the border with Iowa, to Kittson County in extreme northwestern Minnesota, and to Itasca County in northern Minnesota. He emphasized the species was “breeding throughout the state” but did not report any nests from northeastern Minnesota. More than 40 years later, Green and Janssen (1975) described the species’ distribution in a similar fashion, simply stating that it is a resident throughout the state and “frequents groves on the prairies.” A few years later, Janssen (1987) echoed this distribution but also stated that the species was “scarce to absent in many areas of the south-central and southwest regions.” He reported confirmed nesting from 22 counties, including the northeastern counties of Cook, Lake, and St. Louis. Hertzel and Janssen (1998) added another 4 counties with confirmed nesting records since 1970. Collectively the confirmed nesting records include the heavily forested areas of the northeast, north-central, and southeastern regions of the state. Records were scarce in the southwestern and southern counties; Brown County was the only county with a confirmed nesting in these areas. The Minnesota Biological Survey (MBS) included 1,627 breeding season locations in its detailed surveys of counties (Minnesota Department of Natural Resources 2016). The highest density of locations was in northeastern and north-central Minnesota, but locations were scattered throughout the state. For instance, locations were noted in the extreme southwestern counties of Lincoln (4 locations), Murray (2), and Rock (2). However, numerous counties had no records, such as Lyon, Nobles, Pipestone, and Watonwan. The MNBBA further substantiated the widespread distribution of the species in the state with 3,774 breeding records and at least possible nesting from every county (Figure 2). The participants of the MNBBA recorded nesting activity in 43.3% (2,051 of 4,741) of the surveyed atlas blocks and 55.8% (1,305 of 2,337) of priority blocks. These included 75 confirmed nesting records, 60 of which came from priority blocks (Figure 3; Table 1). A total of 31 counties had confirmed nesting records. Nesting records were more densely distributed in the northern forested portion of the state. However, possible or probable nesting was also quite substantial in many southwestern and western counties. Breeding records were sparse in most of the southern counties, but small populations can still be found in wooded areas of this region. The predicted distribution map for the Least Flycatcher highlighted potentially high densities in north-central and northwestern Minnesota and in many other areas of northern Minnesota (Figure 4). These areas generally correspond with forested habitats that are dominated by deciduous trees or mixed deciduous-coniferous forests, such as the Tallgrass Aspen Parklands Province in the northwest, the Pine Moraines and Outwash Plains Subsection in west-central Minnesota, and the Western Superior Uplands Section in the east-central region. In a summary of the Least Flycatcher in North America, Tarof and Briskie (2008) identified few changes in its distribution except for an expansion into Washington State since the late 1970s. The low detection of the species in the southern portions of Minnesota renders Roberts (1932) comment that it is the “most generally and evenly distributed member of its family” as no longer true. This change is also supported by Robbins (1991), who observed that the Least Flycatcher has been moving northward in Wisconsin as mature deciduous forest cover has declined in the south. Breeding distribution of the Least Flycatcher in Minnesota based on the Breeding Bird Atlas (2009 – 2013). Summary statistics of observations by breeding status category for the Least Flycatcher in Minnesota based on all blocks (each 5 km x 5 km) surveyed during the Breeding Bird Atlas (2009-2013). Summary statistics for the Least Flycatcher observations by breeding status category for all blocks and priority blocks (each 5 km x 5 km) surveyed during the Minnesota Breeding Bird Atlas (2009-2013). Predicted breeding distribution (pairs per 40 hectares) of the Least Flycatcher in Minnesota based on habitat, landscape context, and climate data gathered during the Minnesota Breeding Bird Atlas (2009-2013) using the General Linear Modeling method with an adjustment for detectability. The Least Flycatcher occurs in a wide variety of forest types, including upland and lowland deciduous forests, mixed deciduous-coniferous upland forests, mixed lowland swamp conifers, and patches of forest in open agricultural and prairie groves (Bond 1957; Tarof and Briskie 2008). Forested habitats with open understories are especially important (Breckinridge 1956). The National Forest Bird (NFB) Monitoring Program in the four national forests of Minnesota and Wisconsin found high frequency of occurrence and abundance in oak forests followed by red pine, beech-maple-birch, upland hardwoods, and aspen-birch cover types, based on over 900 observations (Niemi et al. 2016) (Figure 5). Primary habitats identified during the MNBBA point counts included pine forests, upland coniferous forests, northern mixed deciduous-coniferous forests, and northern hardwood forests (Figure 6). Typical breeding habitat of the Least Flycatcher in Minnesota (© Deborah Petersen). Habitat profile for the Least Flycatcher based on habitats within 200 m of point counts where the species was present during the Minnesota Breeding Bird Atlas (2009-2013). Partners in Flight (Rosenberg et al. 2016) estimated a breeding population of 31 million adults in the United States and Canada, and earlier estimated 1 million breeding adults in Minnesota (Partners in Flight Science Committee 2013). The MNBBA, however, estimated a much higher density, of 3.6 million adults in Minnesota (95% confidence interval of 3.2 – 5.9 million), based on its point counts. Both Kendeigh (1947) in northern Ontario and Breckenridge (1956) in Minnesota estimated 1.5 pairs per ha. These findings were similar to estimates of a mean density of 1.8 pairs per ha in intensive studies by Sherry (1979) in New Hampshire. However, the Least Flycatcher can be gregarious where it occurs in closely packed territories, which have been reported as ranging from 7 to 91 territories in a cluster (Perry and Andersen 2003; Tarof and Briskie 2008). For example, in eastern Ontario, Tarof et al. (2005) counted a population density of 11 pairs per ha in a clustered population. Based on thousands of point counts in Minnesota’s national forests from 1995 to 2010, mean density estimates were 5.0 and 12.7 pairs per 40 ha in the Superior and Chippewa National Forests, respectively. These data also support the broad patterns of the MNBBA model (Figure 4) predicting higher densities in north-central Minnesota, where the Chippewa National Forest is located, compared with northeastern Minnesota, where the Superior National Forest is located. 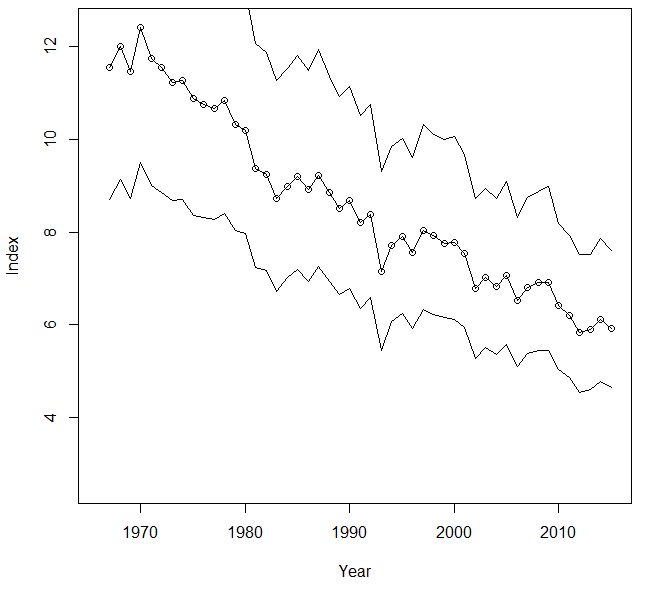 The federal Breeding Bird Survey (BBS) trends in Minnesota indicated a significant decline in the population from 1967 to 2015 of 1.38% per year, and an even greater decline from 2005 to 2015 of 1.72% per year (Figure 7). Significant population declines are more severe across the United States, Canada, and survey-wide from 1966 to 2015; all these declines are approximately 1.7% per year. Partners in Flight estimated an overall population decline of 53% from 1970 to 2014 (Rosenberg et al. 2016). The BBS trends for North America indicated that population declines of 1.5% per year or more were widespread throughout the species’ range (Figure 8). The only areas with increasing populations were in the Dakotas, southern Saskatchewan, eastern Montana, and Labrador; most of these areas have sparse tree cover. The results were somewhat conflicting in Minnesota’s national forests. The Chippewa National Forest had a declining trend from 1995 to 2016 of 1.53% per year, which is similar to the national BBS trend. However, in the Superior National Forest, the trend was stable (Figure 9). Breeding population trend for the Least Flycatcher in Minnesota for 1967–2015 based on the federal Breeding Bird Survey (Sauer et al. 2017). Population trend map for the Least Flycatcher in North America for 1966–2015 based on the federal Breeding Bird Survey (Sauer et al. 2017). 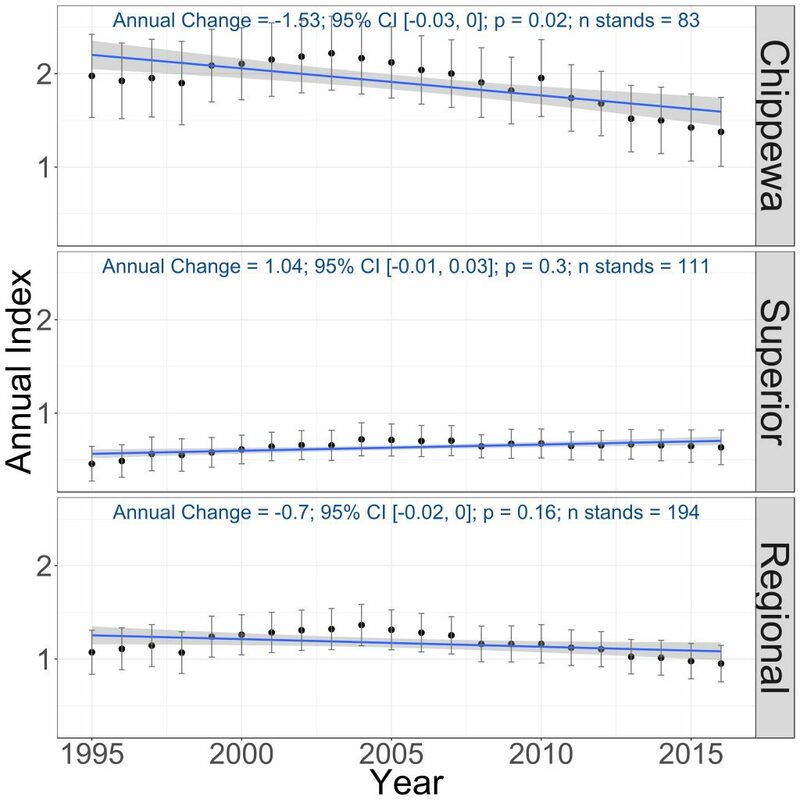 Breeding population trends of the Least Flycatcher in the Chippewa and Superior National Forests and the combined regional trend, 1995–2016 (Bednar et al. 2016). With a Continental Concern Score of 11/20, the Least Flycatcher is listed as a Common Bird in Steep Decline. The species still has a large breeding population in North America, but its decline of over 50% is substantial and cause for concern. Matteson et al. (2009) labeled it a “regional stewardship species” because of its potential preference for large tracts of deciduous forest and its population decline in the boreal hardwood transition forests of northern Minnesota, Michigan, and Wisconsin. The overall goal for this species is to stabilize its population within 30 years. Least Flycatchers appear sensitive to disturbances, pesticides, and deer densities (Tarof and Briskie 2008). DellaSala and Rabe (1987) suggested the species is sensitive to disturbances and tended to be found in more interior portions of the forest. They emphasized that management should include maintaining large contiguous forest tracts and minimizing disturbances. Decalesta (1994) found reduced numbers in areas with understories degraded by excessively high populations of white-tailed deer in Pennsylvania. Langham et al. (2015) and the National Audubon Society (2015), in their review of bird species’ susceptibility to climate change, designated the Least Flycatcher as a “climate threatened” species. This designation was primarily due to the potential 60% loss of its current summer range and the limits in the northward distribution of its preferred hardwood forests. The loss and fragmentation of Minnesota’s forests over the past 150 years has reduced the distribution of Least Flycatchers in the southern and western portions of the state. Population declines identified in the north-central region, where the Chippewa National Forest is found, are consistent with national population trends. The north-central region is more actively being parceled compared with northeastern Minnesota, where populations appear to be stable in the Superior National Forest. Overall, therefore, the impact of forest disturbances on the Least Flycatcher in Minnesota are consistent with more detailed studies of the species. Breckenridge, Walter John. 1956. “Measurements of the Habitat Niche of the Least Flycatcher.” Wilson Bulletin 68: 47–51. Decalesta, David S. 1994. “Effect of White-tailed Deer on Songbirds Within Managed Forests in Pennsylvania.” Journal of Wildlife Management 58: 711–718. DellaSala, Dominick A., and Dale L. Rabe. 1987. “Response of Least Flycatchers Empidonax minimus to Forest Disturbances.” Biological Conservation 41: 291–299. Perry, Ethan F., and David E. Andersen. 2003. “Advantages of Clustered Nesting for Least Flycatchers in North-Central Minnesota.” Condor 105: 756–770. Sherry, Thomas W. 1979. “Competitive Interactions and Adaptive Strategies of American Redstarts and Least Flycatchers in a Northern Hardwoods Forest.” Auk 96: 265–283. Tarof, Scott A., Laurene M. Ratcliffe, Michael M. Kasumovic, and Peter T. Boag. 2005. “Are Least Flycatcher (Empidonax minimus) Clusters Hidden Leks?” Behavioral Ecology 16: 207–217.